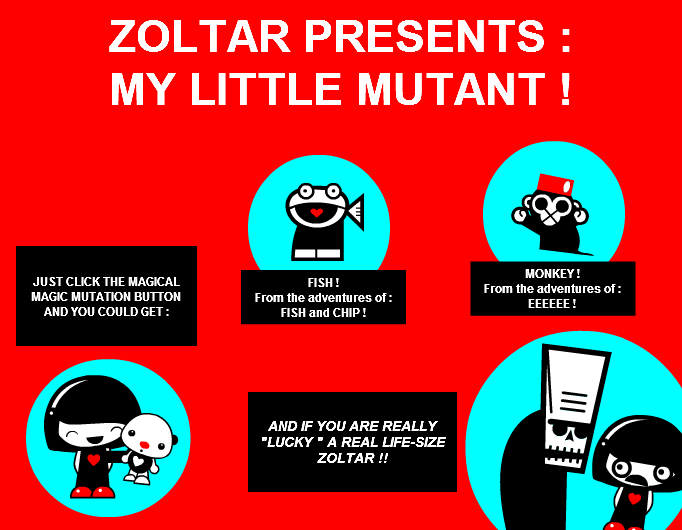 Stripgenerator.com - MY LITTLE MUTANT ! A DIFFERENT MUTATION IN EVERY BOX !! From the adventures of : FISH and CHIP ! From the adventures of : EEEEEE ! AND IF YOU ARE REALLY "LUCKY " A REAL LIFE-SIZE ZOLTAR !! But I don't want a life sized Zoltar. There's a lot of other things on my list. MY CLICKING FINGER IS GETTING SORE!